Although associated with German expressionism and the New Objectivity movement, Max Beckmann occupies his own category as a moral fabulist. His proclivity was for symbolic narratives, often large in scale and complex in iconography, that highlight the tragicomic fate of humanity. The triptych, with its sacred associations, was the format he favoured for important projects, producing a significant number of them at the time of his forced flight from Nazism in 1937. Beckmann's portraits, still-life subjects, nudes and smaller genre pieces are equally invested with a sense of the sacramental. Ever the sceptical recorder of the follies of the world, even his most affectionate works have a cynical edge. 'Mother and daughter' [invested with Beckham's sense of the sacramental]: might be read as a prostitute presented for our inspection by the madam of the brothel. Or perhaps the older woman signifies exhausted Europe, counterpoised with the vital New World of America. Beckmann relocated to the United States in 1947 after a decade spent in Holland. 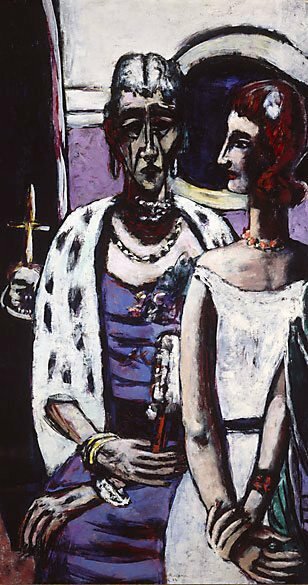 Signed and dated l.c., black oil "Beckmann / ... 46". Catherine Viviano Gallery, 1967, New York/New York/United States of America, with Catherine Viviano Gallery 1967. Exhibited in 'Twelve paintings of women by Max Beckmann' 7 Feb - 4 Mar 1967, cat.no.8. Catherine Viviano Gallery handled the estate of Max Beckmann. Peter Beckmann and Peter Selz, Max Beckmann. Sichtbares und Unsichtbares , Stuttgart, 1965, 101 (colour illus.). Buchholz Gallery Curt Valentin, Beckmann , New York, 1947, (illus.). Art Gallery of New South Wales Foundation Annual Report 1997 , Sydney, 1997, 12 (colour illus.). Renée Free, Art Gallery of New South Wales handbook , 'European', pg. 36-56, Sydney, 1988, 52 (colour illus.). Renée Free, AGNSW Collections , 'The Western Heritage, Renaissance to Twentieth Century', pg. 108-172, Sydney, 1994, 168 (colour illus.). Renee Free, Look , 'Acquisitions: Old Woman in Ermine', Heidelberg, Oct 1987, 9 (colour illus.). Bruce James, Art Gallery of New South Wales handbook , 'Western Collection: Paintings and Sculpture', pg. 17-77, Sydney, 1999, 62 (colour illus.). Simon Kent, The Sydney Morning Herald , 'Gallery boss jumps to Old Woman's defence', Sydney, 25 Aug 1987, 7 (illus). Fritz Neugass, Die Weltkunst , article, Munich, 1967, 590.